Many people have told me how wonderful they thought the service was on Sunday 7th September when Bishop David came to celebrate St Mary's Patronal Festival. It was the first 'united' service that we have held on a Sunday since the new Team Ministry was legally formed. With people from St Nicolas' and All Saints' joining the St Mary's congregation, and with a combined choir of over 40 singers, the church was pretty full. (If you missed it, that was a huge shame - we could still have squeezed you in!) Worship has such a different feel when a large number are gathered together and the church feels full. Like many, I could not help reflecting how wonderful it would be if it were like that every week! Of course, at one time it would have been just like that, but we in Prestbury have been hit by the national trend of declining church attendance - you only have to look around you on a 'normal' Sunday to see that. So, are we just going to sit back and let that decline continue, or are we going to do something about it? Part of the answer to that question is that this has already been identified as a serious cause for concern. During the summer members of the Mission and Outreach committee met with the Revd Angela Butler, the Diocesan Springboard Missioner, to seek some advice from her. They then gave some feedback to the Ministry Leadership Team (MLT) who have already begun to make a response. The MLT considered how many different ways we, as the Church, connect with people locally. It is amazing to see how many there are - if you begin with baptisms and weddings, include uniformed organisations, plant sales and so on, you will find the list goes on and on! The next stage is to consider how we might build on those connections. Asking some serious, perhaps challenging questions. How good are we at 'following up', for example after baptism? Also, considering the crucial question of what we have to offer those we connect with. What we have to offer in the way of welcome, of worship, of suitable buildings, and of continuing Christian nurture. At the heart of all of this questioning (and you will be hearing a lot more about this!) is Our Lord Jesus Christ. He, of course, should be at the centre of our lives and He should be the reason for anything that we do. As we seriously and prayerfully reflect on how we connect with people and share Christ with them, let us first be sure that the light of our own faith shines brightly for all to see, so that in seeing, they may be drawn closer to God. Members of the Hazlewood family have been very touched by the many letters and cards they have received and also for the very tangible warmth and support they felt at coming to Ian's second Requiem at St Mary's on September 6th. Elevate has a core membership of about 6 - 8 young people, building friendships and looking at how God connects with the highs and lows of everyday life. One of the key issues which Elevate and The Space have addressed over the past 12 months has been the challenge of moving from Primary to Secondary schools and we are looking at how we can further support young people through this phase. Having recently upped the age range of The Space to include Year 9 it has been great to see both familiar faces and new ones this term. The challenge is to keep the group fresh for Year 9 while providing a great welcome for Year 7s and not forgetting those in the middle... The emphasis is on choice with organised activities and space just to chat. The All-nighter on 24th October will be a great opportunity to build deeper friendships. Synergy continues to be a thriving and bubbly group (that's not just the Pot noodles!) We are implementing a system of 'Pods' - small groups led by young people encouraging honest application of faith to life and also making it easier to welcome new members. It is exciting to see faith being worked out in very real and challenging situations and young people who are shaping their church and their world developing in character and skills. The residential on March 26-28 will be another fantastic time to move on again! At the beginning of August this year I spent some time at Glenfall House taking part in a Silent Ignation Retreat. It was advertised in the Parish Magazine - my attention was immediately caught by the words 'Retreat' and 'Glenfall House'. Having recently returned to a more active part in Church worship (largely through my Grandchildren's desire to be a part of Sunday Worship - it's amazing how God speaks to us) I felt that I needed time and space to both reflect on my relationship with God and to listen to him. I had not visited Glenfall House since it became the Diocesan Retreat Centre but when it was the home of the Sisters I had been there on many occasions for Quiet Days, meetings and short breaks to benefit from the peace and quiet. (I even helped Sister Francis in the kitchen on odd occasions). I knew, therefore, that the meeting place for the Retreat was one of beauty and spirituality and that an atmosphere of peace and quiet was guaranteed. A completely silent retreat over a period of days was a new experience for me and so I decided to go for the four days rather than the eight days. It was a wonderful experience and one I would certainly wish to repeat. The spiritual exercises of St Ignatius formed the basis of the Retreat; there was a daily meeting with a personal director who was there to offer guidance and suggestions of scripture passages on which to focus my prayer times. It was a quiet, peaceful and uplifting time but by no means easy - praying, reflecting and listening to God required a lot of effort, but it was very worthwhile. I came away feeling renewed, relaxed and challenged with a desire to explore the spirituality movement further. I thank God for this opportunity to renew my spiritual journey and give thanks for the work of the Directors and all at Glenfall House who make Retreats such as these possible. On Saturday 13th September, a lovely sunny day, I chose to cycle in parts of Northleach and Stow Deaneries, starting at the tiny church of St Martin at Charlton Abbots, to which point my trusty steed and I were conveyed by car. Then I set off on the bike, and was quite soon obliged to get off and push it up the first of many hills! St Andrew's, Sevenhampton, came next, then I made my way to St Oswald, Shipton Oliffe, where a wedding was taking place, and on to St Mary's Shipton Sollars. Next stop at St Andrew's Hazleton was followed by attempts to reach All Saints' Salperton through the estate yard. This did not work out, and with time lost I decided to miss Turkdean and go straight on to St George's, Hampnett, before meeting Roger at Ss Peter and Paul, Northleach. Resting on the River Leach bank by the church we had a funny few minutes while six ducks walked all over us trying to eat our sandwiches from our mouths! With a fresh start I called at St Peter's Farmington, then along the valley to St Mary's, Sherbourne, and St Peter's Windrush. After these I was in Stow Deanery, reaching the Barringtons - St Peter's at Little, St Mary's at Great - before the long hill up to St John, Great Rissington, and the steeper short one to St Peter, Little Rissington. Sailing downhill to the last visit - St Lawrence at Bourton-on-the-Water - was sheer delight, and Roger and I enjoyed fish and chips before bundling my bike into the car to make our way home. It was well worth the 35 miles cycled to visit these 16 interesting churches in beautiful Cotswold villages, and I sincerely thank all those who sponsored me. We were to make an attempt at visiting nearly all the 37 churches in the Cirencester Deanery. We started well and were enjoying the Indian summer when soon after leaving our second church, St Kenelm's at Sapperton, and on the way to Coates, disaster befell Andrew's bike. We had to walk into Cirencester for a new tyre and missed out seven of the churches in the south of the deanery. There are eleven churches in or around the town and these we soon snapped up and, with something to eat, spirits were restored. Some of the churches are manned throughout the day and offer simple refreshments and biscuits which we much appreciated. Others just leave the visitors' card to sign, so no chance for a cheery chat. On reaching All Saints' at Preston we were told there were some others from Prestbury and out stepped Pat and Peter Attwood. It was time for some serious peddling along some lovely lanes with delightful views. A further nine churches were ticked off as we reached St Mary's, Cowley, just before we were stopped by the clock, bringing our total number visited to 22. Saturday 13th September was dry and sunny with the wind from the South. I left St Mary's about 10.30 and cycled into Cheltenham collecting churches and chapels, All Saints' and St Luke's, where on signing in I found I was following Frank Merrett. From St Luke's I followed the cycle route beside the Chelt to Charlton Kings, then along the London Road to St Michael's, Dowdeswell, after a push up the hill it was freewheel to St Bartholomew, Whittington. This is an interesting church with the carved figures of two knights, Richard de Crupes father and son and a lady of the 13th century, a brass portrait of 16th century and fascinating corbels. Round the back of the hill the wind was behind me, lunch on a bench under the old yew in St Andrew's, Sevenhampton, then filled my lunch box with lush blackberries from below the graveyard at St Martin's, Charlton Abbots. From the forms I found Gill Ashman had passed in the opposite direction at 10am. The descent from Belas Knapp to Winchcombe was exciting; St Peter's has beautiful features including the altar frontal worked by Catherine of Aragon whilst she lived at Sudeley Castle (I had always thought it was Catherine Parr!) Then I turned for home but Cleeve Hill was in the way, from the top it was downhill, with a brief stop at St Peter's and home at 5pm - 19 churches in 19 miles. Saturday September 13th saw the Parishes of Prestbury and All Saints out in full force on a beautiful sunny, balmy day. St Mary's was represented by Gill Ashman, Jill and Martin Kannreuther and Bob Lyle; St Nicolas' by Father Michael and Anna Cozens, Pat and Peter Attwood, Frank Merrett and Brian and Andrew Wood; All Saints' by Phillip Janes, Tim Winder walking and Charis Winder cycling - (together!). Peter and I loaded our 2 bikes into the rear of the car with a bit of juggling and spanner turning, setting off for Cirencester at 9.15am. A call at the Abbey Church of St John and the info office (with the Farmers' Market in full swing outside) found us parking for the day, with difficulty, outside Holy Trinity Church, Watermoor. Here all was hustle and bustle for their annual garden fête at 2pm. I made a mental note to return there in time for tea and cakes! We negotiated a tricky underpass and set off southwards with level cycling for creaking arthritic limbs. Our route took us to Siddington, South Cerney, Driffield, Harnhill, the three Ampneys, Preston and Cirencester. On the way we met more cyclists from Cricklade and Fairford, families in crocodile and a few local walkers all brandishing circular yellow stickers like ours and we waved to each other. We creaked along on ageing cycles with no headgear while they shot by in streamlined helmets and the aid of a 100 gears! There was a welcome at every church with all kinds of cold drinks and biscuits and members of the laity proud of their churches wanting to show us round. South Cerney and Cirencester had Methodist/United Reform Chapels and, like Prestbury, shared services and other activities with the Anglican Church nearby. The area abounded in lovely Norman architecture with dogtooth and beakhead carving round the doorways and well preserved wall paintings. Ampney St Mary church is situated in idyllic pastoral isolation, several miles from the village - a reminder of the sufferings of the parishioners during the Black Death in medieval times. The village alongside the church lost its inhabitants and fell into decay. The survivors rebuilt their homes well away from the place of burial, as did the inhabitants at Siddington. It was 1pm and we settled down to a picnic and snooze here (Black Death or no!) in the picturesque churchyard. The afternoon got hotter and we got slower - crossing paths with Brian and Andrew Wood and exchanging experiences. With the Fosse Way and the roaring Cirencester by-pass to overcome, we battled our way back to the start and the welcome sounds of the band, the stalls, ice creams and tea and cakes at 4pm after nearly 20 miles! It was, indeed, humbling to visit beautiful historic monuments to past Christians - cared for in tiny hamlets by a handful of struggling parishioners, and a pleasurable way to raise £100, even though our joints complained the next day! Why don't you try it next year? For a number of years a group of us at St Nicolas' have been contributing to 'Save The Children'. Initially we sponsored a boy and a girl in India, providing for their education and helping their families as well, some to become literate for the first time! This was very rewarding. When this scheme ended we became 'Save The Children Children's Champions'. With our contributions of £15 per year each we now help to support all aspects of children's work. Their aid workers find they can respond immediately to war and disaster emergencies and also enable older children to set up projects to help themselves. So Filston, in the Democratic Republic of Congo, with 30 other boys joined a scheme to purify and sell water making between 30p and £3 per day for food, clothes and medicines. Ruth Shaw has agreed to take over the collection of contributions from me. As part of this transition we should like to recruit some new contributors, both to replace ones who have been lost to the scheme over the years and to bring in some new members. If you are interested and would like more information please contact Ruth Shaw. I should like to add that Christine has worked as the SCF co-ordinator for many years and would like to express the thanks of present contributors for all the work she has done. We have had our usual busy summer. We have managed to ring for every Sunday Eucharist and Evening Service, despite many of our ringers enjoying a well-earned summer break. We were pleased to ring for the funeral of Reg Viveash on 26th August. We decided not to muffle the bells, but to ring them open in thanks for his long and happy life. 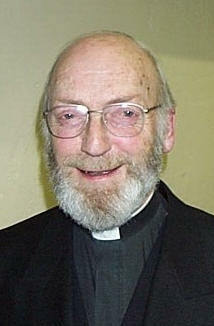 Similarly, on the 6th September, we rang for the memorial service of Fr Ian Hazlewood, again ringing the bells 'open'. We rang several quarter peals during the summer period for the 6.30pm service and were pleased to complete a successful quarter consisting of 1260 changes of Plain Bob Minor in honour of the Patronal Festival on 7th September. You may be aware that for some time the Fabric Committee and the PCC have been considering carefully and prayerfully what changes might be made to St Mary's church to ensure that it will be well ordered and equipped to support the worship of future generations. Members of the congregation have already had a first opportunity to give their views on the options being considered. One of the options is to install a platform and altar at the front of the nave immediately in front of the steps to the choir. The reason for this is simple. The Eucharist is central to so many of our services at St Mary's, yet when it is celebrated at the high altar it is remote from many in our pews and indeed invisible to some 40%. A nave altar would bring the Eucharist to the heart of the congregation. With this in mind, on 11 September the PCC voted unanimously to ask formal permission from the Diocese to install a platform and nave altar temporarily so that we can experience this idea in practice. This will be for a trial period of no more than 18 months, which will allow us to see how it works throughout the church's year. Members of the congregation will have the opportunity to give their views on this arrangement before any decision is made on whether it should become permanent. Now that I am back from my trip, I would like to say a couple of words to thank everyone who helped me in any way with the Romanian Orphanage project. The two weeks that I was out there have been the most successful, fulfilling and tiring. The orphans had been waiting for us with great anticipation and they were all over us the moment we stepped off the bus. The children were very demanding and playing with them was just as exhausting as painting or building. During the two weeks our plan had been to completely redecorate the boys' accommodation, to build an adventure playground and a couple more swings. However when we arrived we discovered that we would have to do a lot of plastering and filling, as the builders had not finished as promised (of course). We were divided into two groups - the workers for the outside and the workers for the inside. I managed to get into the indoor team as I had many ideas I wanted to contribute. The painting was not just straight forward rolling of the paint. We had to come up with designs for the walls to make the dormitories more cheery and welcoming. And of course any free time we had we tried to spend with the kids because this was one of the main reasons behind our journey. The children needed love and attention and we aimed to provide them with it (even though it was only for two weeks). The best moment of the whole visit was on our last day at the orphanage when we took the children around the building. Just seeing the happy and amazed faces of the orphans jumping around the adventure fort, swinging on the swings or discovering their newly painted dorms and bathrooms rounded off a truly rewarding experience. It is wonderful to be able to see what difference we made in a short space of time. I am hoping that after seeing what we have done, the local people will care more for the poor children of Bradet. On behalf of Bradet orphans, I would like to thank everyone, as none of this could have been possible without the great support of all the people who have contributed towards this worthwhile cause. All the donations were greatly welcomed and the children were very glad of any clothes or toys I brought with me. Once again thank you very much for all that you have done to help the Romanian Orphans. PS. I have managed to take some photos, which will be on display in the All Saints', St Mary's, Prestbury and St Nicolas' churches. From 2nd to 14th August 2003, seven guides and two leaders represented Gloucestershire at the Free Life Jamboree in St Georgen, Austria. We had a wonderful two weeks, with a huge range of activities. It had taken about five months of fundraising, letter writing and saving up money, but it was certainly worth it! Our journey to Austria was long and tiring, but at the same time very exciting! We flew from Heathrow to Munich in Germany. From Munich we travelled by train to Linz in Austria, where we were collected by several members and mothers of the Enns Scout Group, who were to be our host group for the fortnight. We travelled in their cars to the Scout hut in Enns. There they cooked us a delicious meal, and we had a very enjoyable campfire where we all taught each other songs. At around 11 o'clock we fell into bed, exhausted, but very excited to be in Austria at last! Over the next two days, the Enns group were wonderful hosts. They took us to many places including the local town, the famous town of Linz, a lake and a swimming pool. I found Linz very enjoyable to look around, and we were even filmed for the Austrian national news while buying ice creams! We also had a ride on a little yellow train which travelled along the bank of the River Danube. We had a campfire both nights, and a barbecue on the last night. By this time, some of our initial nerves had worn off, and we were overcoming the language barrier successfully (mainly because all of the Enns group spoke very good English!). We woke up bright and breezy on the fourth day of our trip, because at 8.30 we piled onto a coach and drove to St Georgen and ... the camp! This was very exciting as we would finally be getting to the jamboree which we had been looking forward to for months, and we were all very chatty on the coach. We arrived at the campsite, and it was just how I imagined it! We were shown to our sub camp, which we all initially thought was huge, but we soon filled it up. It took us around 15 minutes to set up all our tents. We then spent the rest of the day helping the Enns group to put up their huge canvas tents (they had one for the girls, one for the boys, one for the leaders, and one which could have a campfire inside it! ), and also helping them with their constructions. We were all given a set amount of wood, and were able to do what we wanted with it. The Enns group made a huge eating/cooking shelter, a washing up stand and a swing bench. I found it amazing how skilled they were at this sort of construction. Later in the evening, we had the sub-camp and camp opening ceremonies. We didn't really understand the sub-camp opening ceremony, as all the significant bits were in German! However, the Enns group kindly translated for us. At the camp opening ceremony, three of the senior organisers impressively said 'hello' to every single one of the 26 countries at the camp! Then there was a dance which symbolised freedom and peace and harmony. Then the camp song and others were performed while we all danced and sometimes sang along! After the ceremony, we walked as a large group around the camp before falling into bed, excited at what the next days would bring. Our days at camp were mainly very relaxed, partly because the programme was blissfully un-intense, and partly because the weather was so hot. Every day it peaked at over 35 degrees celsius! Days were spent badge swapping, paddling in the stream, cooking, washing up, writing postcards or chatting to each other and our new Austrian friends. The Enns group were terrifically friendly and eager to practise their English on us. We took part in various workshops. For some of us there was Music and Dance, where we learnt the Viennese Waltz, for others it was Self-defence or HighKix - basically a very high High Ropes course. There was a whole day of activities to do, which was named FreeTag. The activities included pavement chalk drawings, writing a message and attaching it to a balloon, and learning about world religions. One evening was 'The Evening of the Open Pots': each country had to cook a meal that was traditional to their country. Then everyone walked around the campsite and sampled many different dishes. We also had an 'unplugged' musical evening, when no sounds coming from sources which need to be plugged in were allowed. We sang a lot of songs with the Enns group, with three of them playing guitars very well. An exciting event was when we went sailing at Lake Attersee. The lake was absolutely gorgeous, with water so pure you could drink it. We sailed in fairly small boats where we were all perched somewhat precariously on the edge! After we had been sailing for about an hour we were allowed to jump in the lake and go for a swim. Aftewards we met up with the rest of the group and set off for the fire station where we were going to be picked up. However, after about 15 minutes we realised we had gone the wrong way! We eventually got to the station and then back to camp. It was a good day out. Our main excursion was to the town of Halstatt for an overnight visit halfway through week two. The Youth Hostel was very cosy, and there was even a 7-bed room, so all our English group was together for one night. After lunch we walked into the town, where we went around the Halstatt museum. This was interesting, especially when we had the English translation read to us. After this, we were told that we had to busk to earn our entrance fee to the salt mine which we would be visiting the following day. This was met with some grumbling, but once we had got started, we had a very good time. Sadly we only raised 1 Euro and 20 cents, and we needed 12 Euros each! We went back to the Hostel (my friend and I got left behind in the town and had to find our own way back! ), had dinner and went to bed quite early, but chatted for hours! We woke up refreshed by having slept in a proper bed, and set off up the large mountain in a very fast cable car to the salt mine. We reached the top, and hiked for about half a mile to reach the salt mine entrance. We were issued with protective tops and trousers, and then we set off into the mine. I really enjoyed the salt mine, as the guide gave us a very interesting tour in English, and to get deeper into the mine, we had to travel down two slides! One of the slides had a device which recorded how quickly you travelled down it, and took a photo of you! It took about one minute for us to emerge from the salt mine on a small train, which was a bizarre experience, as it was 7 degrees celsius in the mine and 37 degrees outside! We returned to the hostel for lunch, and then got on the coach for the campsite. The closing ceremonies of the sub-camp and camp were again very enjoyable. In the sub-camp ceremony, we and the Enns group performed a short piece about our visit to Halstatt in German and English complete with actions. It was very funny, and we were giggling all the way through, as the actions were very silly. We then proceeded to the main stage for the camp closing ceremony. There were two dances by participants of the camp: one hip-hop style, and one traditional Taiwanese dance performed by a group of Taiwanese girls. This was very enjoyable to watch. After this, the camp song was performed again, and then ... camp was officially over. We wandered around the campsite and saw lots of people taking their tents down. We had taken ours down that afternoon, as we were staying in one of the big camp canvas tents with a group of Irish girls for the last night. This was because we had very early start the next day, and didn't want to have to get up even earlier to take down our tents, which would be wet. We all settled down, and woke up at 6 the next morning to begin the long journey home. The journey was going really well: all the trains had been on time, we'd caught the right ones (!) and we'd arrived at the airport with plenty of time. We all got on the plane and it took off. However, about an hour into our flight, there was a problem. There was a fault with one of the engines, and so we had to turn around and land at Frankfurt airport. Here we sat for 20 minutes before the captain said the fault was fixed and we would be taking off shortly. So we sat for another half an hour, before the captain decided we couldn't use that plane after all, and we all had to bundle off the broken plane and onto another one. We finally took off, and arrived at Heathrow at around 8 o'clock - a mere 4 hours late. We all got into the minibus which Hayley's mum and dad had brought to collect us in, and set off for the last leg of our journey home. We arrived back at Hayley's house at 10 o'clock, where our parents were waiting with big hugs. We all said goodbye to each other, and drove off to our own beds at home. At this point, I was really happy to see my family again, but already starting to miss the others, whom I'd shared so much time and fun with over the past fortnight. The Free Life Jamboree was great. Everything about it was great - the setting, the activities and the people. It was brilliantly organised. There was a camp newspaper every morning with breakfast, we always had enough food, and the staff were really helpful and friendly. And our own little group was very well organised and led. We all formed close friendships, and there were no arguments or fallings out. The whole experience was one of the most exciting and fun times I have ever had, and I feel very lucky to have taken part in it. This year we will celebrate Harvest on Sunday 12th October. The Harvest Supper will take place at St Nicolas' on Saturday 11 October at 7.00pm and will be followed at approximately 8.30pm by a performance of Ernie's Incredible Illucinations by Alan Ayckbourn. See weekly notice sheet and posters for ticket details. The next concert will take place in St Mary's church on Wednesday 8 October and will feature piano, violin and 'cello music performed by three senior music scholars from Dean Close School. Coffee and biscuits will be served from 10.30am and the music will start at 11 o'clock. There will be a retiring collection in aid of church funds. All are welcome. Plans for learning and sharing this autumn and winter are well underway, though some details remain to be settled. Here is an outline of what to expect. Whichever of these events you think of trying, your presence will be valued, whether you enjoy joining in discussion, or prefer to listen and take things in quietly. DECEMBER: In Advent we plan a closer look at prophecy, with a single evening meeting, and special attention in Sunday morning sermons to the prophecies of the birth of Jesus. JANUARY: 'Why go to Egypt?' A talk by John Elliott, plus food and time to relax with friends. The following dates take us up to Advent. All start at 8pm. You are welcome. Wednesday 8 October when Fr Tim Raphael will lead our study. Thursday 23 October when Marcus Steel will speak, and probably lead us into discussion. Wednesday 5 November when Fr Grant Bayliss will lead us in a topical study. Thursday 20 November when David and Diane Lyle will focus our thoughts and discussion on their experiences of being Christians in the field of medicine. The All Saints' Education and Nurture Sub-Group are hoping to hold a short course to celebrate the Kingdom Season. This will take place on the four Tuesdays in November, following the regular 8pm Mass and will focus on the Lord's Prayer. We would be very pleased if people from St Nicolas' and St Mary's could join us on these evenings. Final information about this will be available at the All Saints' Patronal Festival.